[This is a] tabular comparison of different translations of Jotapata episode from Jewish War beginning with Lodge translation through Thackeray, and including Josephus variants: PseudoHegesippus, Slavonic Josephus, and the Jossipon. I should have included the Latin as well, but I gave up, I would have to find a Latin text , then locate the proper section and dictionary bash a parallel translation, more work than I felt capable of. There are some interesting differences between the Greek text and the non Greek versions as shown in the table, suggesting some passages may have dropped out of the Greek manuscript tradition, again showing the need for a study of the Latin text to see if these passages are in the earlier Latin manuscripts. It is always interesting to see how different translators handle the same passage, and occasionally disturbing! This should be of interest to Josephus people! An interesting volume has come my way on the quotations in Eusebius. It is Sabrina Inowlocki, Eusebius and the Jewish Authors: His citation technique in an apologetic context, Brill, 2006. This, remarkably, was a PhD thesis in French. The study is interesting enough that I should like to read the paper volume. I have a PDF but reading more than a bit on screen is impossible. But sadly the price at $150 renders that impossible. However the PDF is indexed, and as a result I keep finding good things. The changes brought by an author to the cited passage vary substantially. They generally consist in the omission or addition of words, in grammatical changes, in the combination of citations, and in the modification of the primary meaning of the quotation. These changes may be deliberate, which means that they are made by the citing author specifically in order to appropriate the content of the citation.52 They may also be accidental. If deliberate, the changes result from the author’s wish to adjust the citation to his own purposes, to ‘modernize’ the stylistic expression of a more ancient writer, or to adapt the grammar of the cited text to that of the citing text. It may be noted that deliberate changes do not always stem from the citing author’s eagerness to tamper with the primary meaning of a passage, as modern scholars often suspect and harshly condemn. 53. De philosophia ex oraculis I, p.109-110 (Wolff) = PE IV. 7. 1. The sense, in other words, is what Porphyry transmits, not the exact words before him. This is perhaps easier to understand if we remember that the copies before him were manuscripts, and so could easily contain corruptions. This passage emphasizes the prominence of the meaning of the text over its phrasing: The nous is clearly opposed to the lexis.54 Porphyry claims not to have tampered with the noemata of the oracles but he does not claim that he has not changed the terms and expressions of the cited text.55 Yet it should be noted that the respect shown to the meaning of the oracles is due to their sacredness. Similar attitudes are also found among Jewish and Christian authors regarding the modification of the Scriptures. Such changes are even more harshly condemned in the Jewish and Christian traditions.56 This was not the case with secular texts, as can be seen from Porphyry’s use of citations in his De abstinentia.57 Porphyry was especially gifted in manipulating texts, although the concept of manipulation hardly applies to antiquity. At any rate, the neo-platonic philosopher was not the only one to do so. Plutarch, who is well known for his extensive use of quotations, does not hesitate to transform the passages he cites by omitting, adding or modifying terms or expressions occurring in the quotation. Not even Plato was spared by him. In addition to the distinction between sacred and secular texts, the treatment of prose citations differs from that of poetic citations. Indeed, it was more difficult to modify poetic texts because of the metric rules. Moreover, in many cases, the readership knew them by heart. This was especially the case with Homer. As Stanley has pointed out in a study on Paul,60 the status of Homeric poems in Hellenism was to some extent comparable to that of the Scriptures in Judaism and Christianity. Both texts constituted the most authoritative text. Homer had been critically edited in the Hellenistic period and this ‘vulgate’ was in general faithfully copied by second-century C.E. authors. This observation may probably also apply to Euripides’ and Sophocles’ tragedies. However, the poetic text cited by the ancient authors is not always identical to that which has reached us through direct transmission, i.e., in manuscripts. Several explanations other than the responsibility of the citing authors may be suggested. 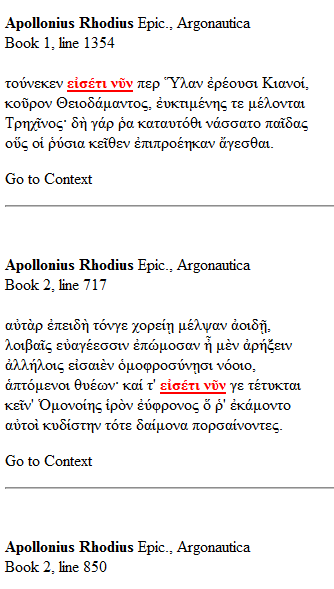 Firstly, the authors often cited passages from memory and therefore made mistakes;61 secondly, in the case of Homeric quotations, the authors could use a text other than the Alexandrian ‘vulgate;’ thirdly, most authors excerpted passages from florilegia rather than from the original text;62 finally, some differences may be due to the corruptions to which medieval manuscripts were subject. As for prose texts, they could be more easily modified thanks to the flexibility of their form. They could easily be summarized, paraphrased and transformed. It is worth noting that the faithfulness to the text also depends on the feelings of the quoting author towards the quoted author. An author such as Strabo, whose faithfulness to the Homeric text has been shown by Stanley, proves to be rather loose in his citations from Herodotus.63 Likewise, Plutarch quotes Herodotus faithfully only in half of the cases64 whereas it is well known that he cites Homer faithfully. But here we must halt our quotation. Most of the footnotes refer to studies. Isn’t this fascinating stuff? It is really useful to hear Porphyry’s statement. It is really useful to hear some solid examples of how ancient writers handle these things. The author, Sabrina Inowlocki, is a Eusebius scholar, and her study of the quotations in the Apodeixis (i.e. the Praeparatio Evangelica and Demonstratio Evangelica) is really interesting. But it’s the kind of book to read through. What a murder it is, that so useful a volume, funded by a tax grant, should be obscured by such a high price! It’s always nice when my blog posts attract attention. I learned last week that an old post of mine, from 2013, has attracted a response from a professional atheist polemicist named Richard Carrier. In a rather excitable post here on his own blog he roundly denounces my casual remarks, and indeed myself (! ), and offers a new theory of his own. A correspondent drew my attention to this, and asked me to comment. My original post was written after I happened to see an article by the excellent Josephus scholar Louis Feldman. This tentatively endorsed the fringe idea that Eusebius of Caesarea (fl. early 4th century) may have composed the so-called Testimonium Flavianum (TF), the rather odd passage in Josephus Antiquities 18 which mentions Christ. This claim is not one that anybody has previously had much time for, and I didn’t see any purpose in rebutting it. Feldman was only summarising work by others, I felt. But then I saw something interesting. 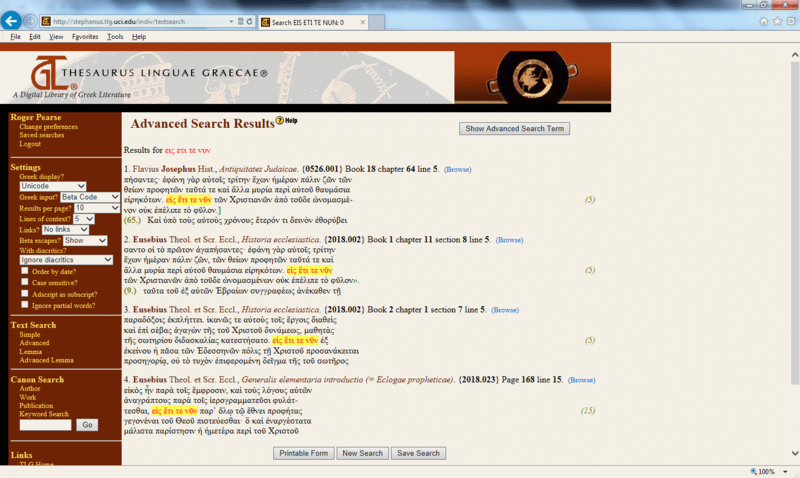 The article made the claim that, if you search the Thesaurus Linguae Graecae database for a phrase towards the end of the TF, “And the tribe of Christians has not died out even to this day” (eis eti te nun – even/still to this day), then it gives a bunch of hits in Eusebius’ works, and pretty much nowhere else. I do computer searches. I’m interested in Eusebius. So I did the search for the phrase, but I got only a handful of results. Disappointed, I blogged about it, added some cautions on rushing to conclusions from these kinds of matches, and thought no more about it. Last week I learned that, after four years, Richard Carrier has written a blog post in which he asserts rather over-enthusiastically that I simply did the search wrong – that instead I should have searched for eis eti nun; the te is just a particle, with the vague sense of “and”, and the two phrases are pretty much the same in meaning. Of course the two are indeed more or less identical in meaning. Carrier’s search produces splendid results. It gets 94 matches. Of these, 6 are later than Eusebius; one each in six authors. The other 88 are entirely in Eusebius. In other words, practically nobody in all Greek literature ever uses the phrase other than Eusebius, if we can trust this search. It looks like the claim that Eusebius wrote the TF is proved! But 88 out of 94 is not just a good result for the theory. It’s a fabulous result! In fact, it’s too good to be true. It’s like a Soviet election result with 99% voting for the official candidate. The number is supposed to produce confidence in the result, and does the opposite. It’s a sign that we need to sanity-check what we are doing. Doing so produces instant discomfort. Surely “even to this day” is a trivial phrase? Are we really saying that Eusebius invented something as obvious as that? It seems unlikely. Imagine a Greek, complaining about his neighbour, as man has done since time immemorial. Would he not say, “How long has this been a problem?” “Oh it started when we landed, and it has continued even to this day.” How else would you express that idea? In fact, if we look at little further we find that the idea in rather similar words is indeed kicking around well before Eusebius, six centuries earlier, in the third century BC. Apollonius Rhodius uses the idea in his Argonautica. He uses it to tie together past and present, in precisely the way that Eusebius does. The historian Polybius uses it, the poet Callimachus uses it. Nobody in our corpus uses it like Eusebius does; but then nobody is writing quite the kinds of works that Eusebius is. So why didn’t these authors appear in the results, when we do the search? Because these rely on searching for versions of eiseti nun, which differs only by a word-division and means much the same thing. We can omit te; we can replace it with the stronger equivalent kai; we can run eis and eti together, especially when we know that Greek manuscripts did not feature word division. Any claim that depends on the presence of a space in the text is a pretty fragile one. eis eti te nun – 4 hits. Josephus (1 hit), Eusebius (3 hits). eiseti te nun – 7 hits. Eusebius (4), Sozomen (2), Oecumenius (1). eis eti nun – 94 hits. 88 are from works of Eusebius, and the other 6 are later: Didymus the Blind (d.398) On Genesis, Procopius of Gaza (5th c.) Commentary on Isaiah, Stobaeus (6th c.), Chronicon Paschale (6th c.) and two 12th century Byzantine writers. eiseti nun – 142 hits. Mostly pre-Eusebius; 7 hits in Apollonius Rhodius (3rd c. BC), Timaeus Historicus (3rd c. BC), Polybius (2nd c. BC), Philo (1st c. AD), Aelius Aristides (2nd c. AD), Lucian (2nd c.), Oppian (2nd c.), Clement of Alexandria (ca. 200), and others. But Eusebius (63 hits) and Sozomen (41 hits) do appear. eis eti kai nun – 23 hits. 2 hits from Porphyry (3rd c.) from different works. Some from Eusebius, Gregory of Nyssa, Gregory Nazianzen, and then Byzantine writers. eiseti kai nun – 110 hits. Callimachus (3rd c. BC), Herennius Philo (ca. 100 AD), Lucian, the Book of Jubilees (ca. 150 BC), Eusebius (56 hits) – especially in the commentaries on Isaiah and Psalms – Eutropius, Chrysostom, Palladius, and Byzantine writers. Also an LXX variant reading for Isaiah 9:6 (given by Eusebius). All of these do show significant use by Eusebius. Some of these show pre-Eusebian use; others don’t. In fact Carrier is quite well aware of the pre-Eusebian results, which he proceeds to mention briefly in a paragraph that reads as if it was tacked on afterwards. But it’s terrible stuff. Clement of Alexandria is just a Christian, so he doesn’t count (?!). Polybius doesn’t count because no other historical writer after him uses this phrase. In fact Carrier has changed his argument; from “only Eusebius uses this, so it proves that Eusebius forged the TF” – a defensible argument, if wrong – to “Eusebius uses this more than anyone, so that proves that he forged the TF”. Which, of course, it does not. Carrier has defeated himself. Here’s the rub; the success or failure of our search comes to depend on us, on our judgement, on our ingenuity, on our knowledge of Greek. This subjectivity was precisely why, in my first blog post, I never proceeded beyond the exact match. There are further possible issues with this method. Only 1% of Greek literature has survived. Much of that is biased towards technical, classical or ecclesiastical writings, those that were useful to copyists in the Dark Ages. The TLG contains only a portion of that 1%. Someone who knew more about computational linguistics than I do could easily point out more problems. The database itself is not “clean”; it is comprised of texts edited by many different editors, whose choices from the manuscript tradition will reflect their preferences. One example of this may be found in searching outside the TLG for eis eti nun. The TLG gives no hits before Eusebius. But I find that the 1831 R. Klotz edition of Clement of Alexandria, Protrepicus, has three hits for it. In the TLG, based on the GCS edition, eis eti is replaced by eiseti. There is no indication in the apparatus as to why. The results of each database search are therefore a reflection of editorial choices. Stylistic analysis, whether manual or automated, can be something of a trap. It’s terribly easy to forget how little we really know about the texts before us, the language which none of us speak as a native and which changes considerably over the thousand years before us, the vagaries of editors, the influence of ammanuenses and copyists, and of the non-literary spoken language, which surrounds the literary text like a warm bath at every instant but is almost invisible to us. To sum up, we saw that a search for the exact phrase does not confirm Carrier’s claim. A search for revised phrases which mean the same does not confirm the claim either. Attempts to dodge this simply destroy the argument. Now let’s go back to where we started. The argument in Feldman’s article was that the use of this phrase proved that Eusebius wrote the TF. We don’t want any implicit assumptions here, so let’s lay the argument out explicitly. The claim is: (1) we have no evidence that eis eti te nun (etc) was used in Greek literature before Eusebius; (2) the search proves that Eusebius uses it extensively; therefore (3) any use of the term proves that Eusebius composed that bit of text; and (4) the TF as found in the Church History of Eusebius does contain it; so (5) Eusebius composed the TF. The second point is correct. Eusebius does use the eis eti nun phrase extensively, once or twice in every book of the Church History, and elsewhere. But the first point is dodgy, and so is the third. We have seen that in fact we do have evidence of its use for 6 centuries before Eusebius. But let us suppose for a moment that the TLG searches did in fact show, as Carrier contended (before he discovered otherwise), that nobody used eis eti nun before Eusebius. The argument still is flawed. For this argument is an argument from silence – that we have no evidence that anyone else … so it must have been him. Arguments from silence are not valid. The archaeologists never tire of telling us that absence of evidence is not evidence of absence. It is the first thing that we must remember. And we’re searching only a subset of 1% of Greek literature, as we saw. According to Carrier this means that we don’t have any evidence of use before Eusebius … very well. But even then we don’t have all the evidence. We have only a fraction of it. In conclusion, the claim that examining the use of eis eti nun proves that Eusebius composed the TF is not correct. The claim itself seems to involve an argument from silence. And the silence itself can only be sustained by ignoring the exact matches, using a related search, and then finding reasons to ignore other related searches. The so-called Testimonium Flavianum of Josephus has provoked extensive discussion down the years, not all of it either measured or even sensible. One witness to the text is the Arabic versions. These were handled in a rather mangled way in 1971 by Shlomo Pines, who introduced the world to their existence in the World History of Agapius (a.k.a. Mahbub ibn Qustantin), the 10th century bishop of Hierapolis. Pines made use of the CSCO edition, which rather misled him, and proposed that this version of the Testimonium preserved features corrupted in the Greek as it now stands. Part of Agapius’ work is extant only in a single damaged manuscript in Florence. But the CSCO editor of Agapius, Louis Cheikho, believed that his text was quoted at length by the 13th century Coptic writer al-Makin Ibn-al `Amid, and so included extracts from the latter’s unedited work in an appendix. Pines made use of the latter on the basis that this was “Agapius”. But the actual text of Agapius is given in the Florence manuscript. What al-Makin says may now be considered, since Martino Diez has kindly edited and translated the text for us. And likewise Josephus the Hebrew says in his writings on the Jews: in those days, there was a wise man named Jesus. He lived a good life, distinguishing himself by his learning, and many people, as many Jews as of other nations, became his disciples. Pilate condemned him to crucifixion and death. But those who had become his disciples did not cease to be so, and affirmed that he had appeared to them three days after the crucifixion and that he was alive. Perhaps he was the Messiah of whom the prophets speak. Diez edits the text from the single manuscript of the “expanded” recension accessible to him, Ms Paris BNF, arab. 4729, where it appears on folio 108r, lines 1-6. Pines made use of Paris BNF ar. 294, f.162v-163r. As Diez rightly remarks, a study of the other witnesses to this recension of the text of al-Makin is necessary before much more is done. The Coptic Historian al-Makin Girgis ibn al-`Amid (1206 – after 1280) is the author of a universal history known as al-Magmu` al-Mubarak (‘The blessed collection’). This work is divided into two parts: a section on pre-Islamic history, still unpublished, and a summary of Islamic history, edited by Erpenius in 1625 and completed by Claude Cahen. The article analyzes the two recensions of the first part of the Magmu` through the comparison of three manuscripts, in particular as regards the sections on Hellenistic, Roman and Byzantine history. After discussing the particular version of the Testimonium Flavianum which can be found in the longer recension of the Magmu`, the article traces the fortune of al-Makin in subsequent Islamic historiography, especially al-Qalqašandi, al-Maqrizi and Ibn Khaldun. Al-Makin is the big unpublished Arabic Christian history. His version of the Testimonium Flavianum in the first half of al-Makin’s work was referenced by Shlomo Pines in his well-known article on the subject, when discussing Agapius, but a look at the French translation of Agapius reveals that Pines must have used Al-Makin’s version extensively. The article is in French, but promises to be very interesting! Watch this space! Update (16th Dec. 2013): I had not realised that the article was online. I’ve added the link, and also corrected a typo in the title. This brief phrase, I would like to suggest, may–I repeat, may–give us the key to the whole puzzle as to the legitimacy of the Testimonium Flavianum. That key is now available to us because of the compilation during the past few decades of the Thesaurus Linguae Graecae, the complete dictionary of all the Greek words in all the extant Greek literature. In such a thesaurus, one would expect such a phrase to appear not hundreds but thousands of times, and it does appear frequently; but the only writer in this entire collection of many thousands of Greek texts to use this phrase with the words in this order, aside from Josephus, is Eusebius, in whose writings it appears three times. This phrase thus appears to be a favorite of Eusebius and of no one else, at least of extant writers from that period. Now this seems really rather impressive (to me, anyway). But we must always verify our facts. Let us do a textual search on the TLG for eis eti te nun. What do we get? We get precisely four results. I’m not sure what search term produced “frequent” results. 1. The first result is Josephus himself. So far so good. 2. The second result is … erm … Eusebius quoting Josephus in the Church History book 1, chapter 11, verse 8; English translation here. This, of course, is neither here nor there as far as Feldman’s theory is concerned. 3. The third result is from book 2 of the Church History, chapter 1, verse 7; English here. It is not obvious from this list of data just why this means that Eusebius composed the TF. So at this point we may ask ourselves what Feldman’s argument was again. It would be advisable to place the argument in our own words — to avoid the danger of being influenced by rhetoric — and to make explicit any inferred arguments. If two writers both use the phrase eis eti te nun, and only two, then this must mean that one has read the other, and that one is copying the other or has composed both. Josephus uses this phrase once. Eusebius, who is later, uses it twice (ignoring the verbatim quotation of the TF). Therefore Josephus did not write it, but Eusebius did. I think most of us will be perplexed a little at this logic. The first part of the argument seems very risky in a number of ways. The phrase is a simple one, and ought to appear, as Feldman acknowledges, all over the place. But the TLG as it stands reports only 4 results. 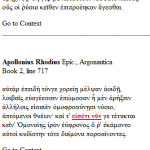 It would seem possible, therefore, that the TLG database is not representative of Greek literature or speech. Since only 1% of ancient literature is preserved, and the TLG contains only a portion of that 1%, it is not impossible that this supposition is correct. But if the TLG is not comprehensive, then the presence of only 2 authors in the search means nothing; only that the TF is not comprehensive. In regard of completeness, it is suspicious that no other quotations of the TF appear in the results. Is it really the case that no later Greek author quotes the TF? Likewise a phrase of 4 words is not much of a fingerprint. Finally, arguments from parallels are always dangerous, because trivial parallels can be mistaken for significant fingerprints. They can arise in a great number of ways, and do not necessarily involve connection, never mind derivation. For instance literature derives from oral speech. Phrases appear in multiple places in modern literature, not because the authors know each other but because of some other source. The popularisation of the term “chillaxing” by British Prime Minister David Cameron in 2010 will undoubtedly have left its mark in the literary record; but woe betide any subsequent scholar who draws conclusions from comparing literature, rather than seeking its real origin. The fourth part of the argument is a non-sequitur. If we allow a connection, it may arise in a number of ways. The first possibility is the simplest. Let us suppose that Josephus wrote those words. Let us suppose that Eusebius copied them for the HE I, liked the phrase, and, having it in mind, repeated it when he composed book II, and, later, in the GEI. What could be more natural? What need is there to suppose anything other than copying? Why are there two versions? Is Eusebius quoting from memory and tripping up, or using different copies of the text? — for how else can the same quotation have two different wordings? But if he is quoting from memory a favourite saying then why does he get it wrong? This, surely, is evidence against the “favourite” argument. If he has access to copies with two different versions, then of course there is a textual problem at this point with Josephus in transmission, which means that arguing from a parallel in the text is pointless because in this case we don’t know what the text is. We might also consider the well-known phenomenon of harmonisation. This is most familiar to us from the New Testament and the Lord’s Prayer where — I am told — the version in Luke tends to become assimilated to that in Matthew in the manuscripts, as the former was more familiar. Now Eusebius HE is a common text. Josephus’ Antiquities 11-20 is comparatively a rare one. The TF was so well known by itself that it intrudes into Josephus Jewish War. The conditions are right for assimilation in transmission. Do we know for sure that, far from Eusebius composing the TF, the copyist of the 9th century ancestor of all our modern mss. of Antiquities 11-20 did not harmonise the text with the HE, conciously or otherwise? We do have evidence that assimilation did occur in versions of the TF. Jerome quotes in Latin in De viris illustribus a somewhat different version of the text. But I am told that in the Greek translation of DVI, someone has “corrected” the TF to the version found in Eusebius HE and Josephus. On the other hand, the DE is also a rare text. Evidently harmonisation was not that commonplace. But if we do assume a connection, and we allow for harmonisation, then it is equally likely that the Josephan TF is merely a scribal copy of the Eusebian version in the HE, itself probably corrupt, and that the real text is lost. If Eusebius (or his literary assistants – we must remember that there are problems with the quotations in the HE) did write down the TF from memory, and did so differently in the HE and DE, then of course errors of memory are possible and Eusebian phrasing may be introduced by a normal text-critical path. Some will also feel rather concerned at the tiny data volumes – 4 words, 2 quotations – involved. Are these numbers large enough to be statistically significant? Databases can tell us much, but they can also mislead if used without awareness of the pitfalls, and without devising a way to exclude false positives. In short, the argument put forward by Prof. Feldman is interesting but unconvincing. The data does not require the hypothesis of Eusebian composition in order to explain it. UPDATE (17/2/17): In a new article, atheist Richard Carrier complains here that, for the purposes of the theory, I should have searched for eis eti nun instead of the exact phrase in the text of Josephus, eis eti te nun. In fact I just searched for the “brief phrase” that Feldman gave, and I didn’t look further for ways to make it work. But let us by all means discuss this in a separate post when I have had a chance to look at the TLG. Did Eusebius forge the Testimonium Flavianum? Notoriously some years ago Ken Olson revived this allegation. 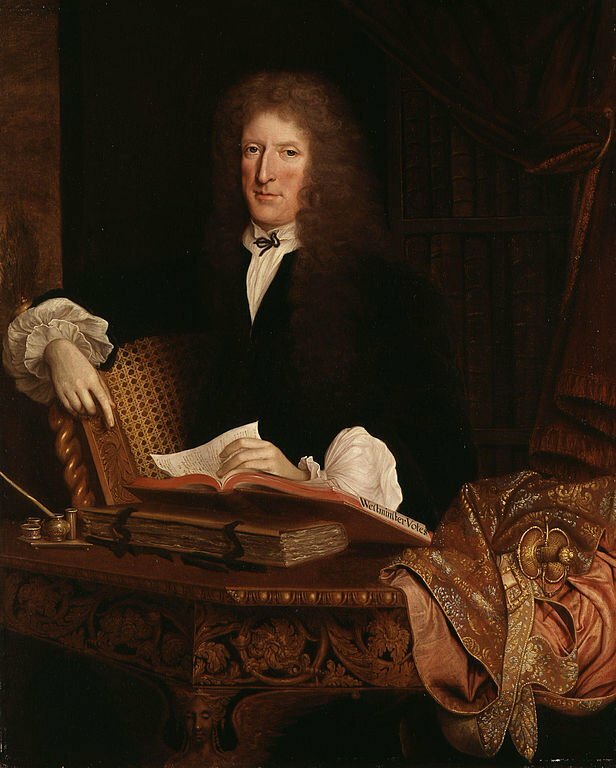 I have today found an article by Alice Whealy, who specialises in the historiography of the Testimonium Flavianum, reviewing Olson’s arguments and disagreeing fairly firmly. It appears in a collection of articles, and there is a preview on Google books. Does anyone have an electronic copy of the whole article? Alice Whealey, Josephus, Eusebius of Caesarea, and the Testimonium Flavianum, in Josephus und das Neue Testament, Tübingen (2007), p.73 – 116, here. Posted in From my diaryTagged Josephus, Patristics, Testimonium FlavianumLeave a Comment on Did Eusebius forge the Testimonium Flavianum?